Heritage Roses are any variety 75 years old or older. They are often sought after for their amazing variety of growth habit, foliage and hips which are complemented by the wide diversity of blooms. The majority have exquisite fragrance. They are often vigorous and can be found in old homesteads and cemeteries thriving on decades of total neglect. Noisettes, Rugosas, Hybrid Musk, Early HT and Floribundas. (Hybrid Wichurana 1921) - A large flowered rambling climber, bearing masses of salmon pink to aprico..
(Rugosa 1894) - In addition to the lovely mid pink semi-double flowers, this plant also produces att..
(Alister Clark pre 1918) - Large flowered semi-double blooms of dark crimson. Flowers are produced f..
(Rugosa 1892) - Large, beautifully white, semi-double, crumple-petalled blooms that are surprisingly..
(Bourbon-Hybrid Perpetual 1867) - Slender, upright growth is crowned with richly scented clusters of..
(Hybrid Musk 1939) - Lovely large, fully double apricot blooms fade to white on a beautiful Hybrid M..
(Polyantha) - An old fashioned buttonhole sized, double pink blooms in perfect Hybrid Tea form with .. Vigorous climbing sport of the bush variety. Small perfect double pink blooms, flowering mainly in s..
(Gallica 1746) - Large ruffled crimson purple. Blooms have many petals. Few thorns. 1.5m tall. Good ..
(Noiset 1904) - Informal apricot to yellow blooms. The virtually thornless plant can be allowed to g..
(Tea 1857) - A vigorous spreading bush with large, cupped pink flowers. Nearly continuous in bloom, ..
(Prorug-Rugosa 2010) This beautiful Tasmanian bred Rugosa rose produces fragrant purple double bloom..
(Bourbon 1919) - Soft shell pink scented blooms. A sport of Zephirine Drouhin. 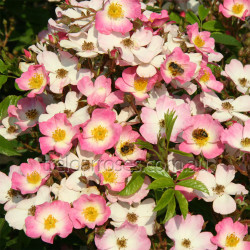 Thornless bush to 2m ..
(Bourbon 1881) - Large, deep pink blooms are world renown. The very fragrant blooms are borne in clu..
(China Rose 1894) - Open twiggy bush. Multi-colour blooms of coppery yellow that change to a pinky c..